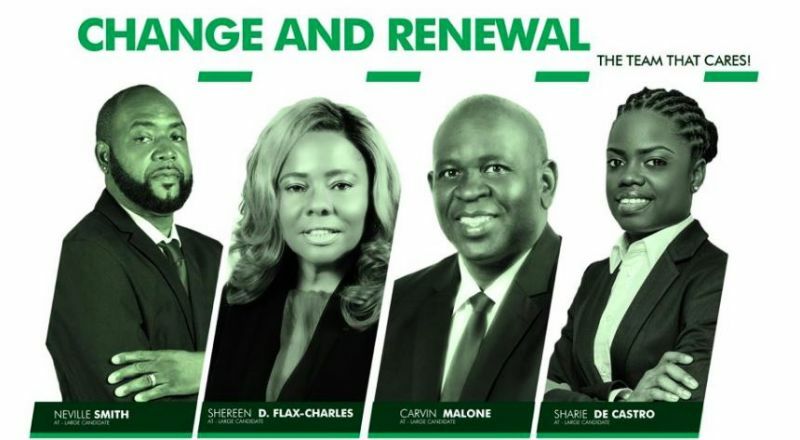 Launching last Friday, February 8, 2019, in the capital city of Road Town, Tortola, were At-Large Candidates, Mr Neville A. Smith aka ‘Sheep’, Ms Shereen D. Flax-Charles, Ms Sharie B. deCastro and Mr Carvin Malone each taking the podium to loud applauds and cheers from a packed crowd of family, VIP supporters and other well-wishers. Social Activist Ms Flax-Charles, in opening her speech spoke about the dire need to empower women and girls to be agents of change in the community. “People of the BVI, before you is… a woman with a heart, a woman with her passion for her BVI, a woman who is an agent for the change we seek… I am not afraid… to be bold… I am not afraid to do what needs to be done for our BVI,” she said emphatically to those gathered. According to Ms Flax-Charles, we must reject the notion that sexual harassment is a cultural norm of the society and she underscored the importance of family life and improving working conditions for women. “We must look at the proverbial glass ceiling. There are women in high positions in the BVI, but are these [the] positions that give them the requisite power/authority when they sit around the table or are women just in a position to write papers?” she questioned. Quoting Alexandria Ocasio Cortez, Ms Flax-Charles said, “You don’t have to be perfect, but you do have to be 100% committed… I stand here before you and say I am not perfect…but I am 100% committed to do the right thing for our people and for our country.” Her speech was welcomed to the loud applause of those gathered at the event after she opened with a musical performance. Zeroing in on the tourism industry, he says he plans to expand its products and creates job opportunities for young and old. Further, he said that as part of his plans for the entire territory, he will look into improving the Territory’s infrastructure, beginning with restoring and resurfacing the road network and addressing the needs of the public transportation service in addition to fixing drainage and sewage issues. “I envision a community that puts education first. A community that thrives on literacy, whose public school infrastructure are top priority and whose teachers’ are paid for their value,” he further stated. Mr Smith said in the end, his overall vision is to have a Territory where “visitors can brag” the second they exit the plane and cruise ships and take a drive or a stroll through the island. “People of the Virgin Islands, I envision a people, gleaming with hope and pride to be living in the BVI,” he said to more loud applause. Ms deCastro in her opening speech spoke of her struggles to put ‘pen to paper, words to ideas, and solutions to issues.’ She told the audience gathered, “I just couldn’t get beyond the truth of where we are as a territory,” in highlighting the plight of the Virgin Islands before and after the hurricanes of 2017. 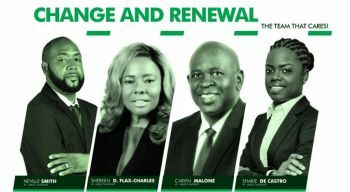 “I dare you to solve the infractions we continue to face, I dare you to make the decisions you know are necessary for our future, I dare you to be more than a vote, I dare you to be a voice for change,” she said in encouraging the people of the VI to vote for a new direction under the VIP come elections day. Businessman Mr Malone, whose speech focused and how the VIP plans to develop the territory from an economic standpoint, underscored his concerns for the territory’s finances. “I am concerned about the direction in which our territory is headed… that the UK has found it necessary to retake control of our finances and our capital projects,” he said in reference to the UK created Recovery and Development Agency (RDA) while pointing to the failures of the Dr. Smith led National Democratic Party (NDP 1). Like deCastro, he focused on the job market and the fact that many of the Territory’s top positions are being handed over to foreigners, “I am concerned that every critical position that we once directed, is now headed by anyone else but us,” he said. Mr Malone further said that the current government had failed to submit over 10 years of audited financial statements on a timely basis, “now that they are submitted, the public does not have a clue what is in them.” He told those gathered that a new government will now have to enter the next four years of rule in the dark, just to discover what the NDP 1 has hidden. Further, he said, “I am concerned that major capital contracts are being issued during this lame-duck period without the source of funding being budgeted or identified. A continuing violation of the protocol that is being allowed despite numerous investigations,” he warned. According to Mr Malone, laser focus is required to take the territory forward and if elected, the VIP will begin the process of developing the people and the next generation through a number of initiatives that will see the improvement of schools, community centres, local industries, emergency services, entrepreneurship, agriculture and other key areas. simply my perspective: after two consecutive terms in government office; the Current National Democratic Party administration came under scrutiny and serious allegations about missing tax money(almost one hundred million united states dollars): in my personal opinion, it will be a lack of common sense to grant the National Democratic Party a third consecutive term in the government treasury: the national democratic party administration came under scrutiny both locally and internationally(play the tape)....this not a paid political announcement? Mr Malone said that the NDP has not produced financial audits for the past 10 years when they have only been in office 7 plus years smh! Do the Maths! Sharie De castro speaking about the signs were there like an earthquake. Really???? Why places like California not predicting earthquakes to warn their citizens in advance if signs are there to predict such?? My mental plates are colliding listening to this stuff! Mr Neville Smith, one does not have to be a politician to help the youths, look at Mr Henderson Title (MALE) proving that much can be done for our youths even ss sn NPO. and i dare say by a "Non-Indigenous" member of society also. What have you done "Sheep" to help the homeless and neglected prior to your candidacy? Did you at least donated some Alphabet Soup to the FSN pantry? C'mon folks, let's keep it 100! The BVI is too small to try to fool the populace. We see each other everyday and many of us are unapproachable and not even friendly to serve the wider public. Let's keep it real! If VIP had a clean leader y'all would have stand a chance.nuff said. You need to go sit dung. Orlando was a clean leader and look what happen to him. You keep off the VIP leader he is no worst then them that kill the country. He need a chance to see what he can do to bring back the country from off the black list how the NDP 1 and 2 have it. Ronnie think he is so innocent but he was there around the round table sipping in the action. They drink so much wine around the round table and get drunk and could not think on what they were doing to the country and run the ship aground. Maybe you are the one that’s not friendly have you ever think of that? Why was VIP replaced by NDP in the first place? They have had to do something very wrong for the people to turn on them. So not so fast pointing their political fingers. Let’s get to the bottom of this. Election time is NOW! Time has run out, so everyone should pick the team that they feel will move the BVI forward. Praying for the BVI because we cannot take another financial crises. TO BE OR NOT TO BE THE NEW DEALERS OF DEMOCRACY! “THAT THE NON-VIRGIN ISLANDER VOTER ASKS NOT THAT YOU MATTER TO THE VIRGIN ISLANDERS BUT THAT THE VIRGIN ISLANDERS MATTER TO YOU; just this one Moment in Time, just this Election Cycle, and just this Legislative Session so it can never be said you didn’t give the people what they wanted! Some contend with, I relish, in the concept that the BVI and my people are a unique “lifestyle”, and this “lifestyle” has brought us to this “desert’” space – and where there should not be a fork in the earth – everyone sees it clearly as a “camel” in the desert and it’s digging and digging, and digging away at a society that is surrounded by the most beautiful crests and seas, and suns and moons. I’ve become stoic, and as I grapple with the process of a “newer deal” once again I ripple and tear up convinced that all politics has to be local. So perhaps the locals will take back control of the BVI and the “camel” that has no adaptation to the BVI may get something figured out by the locals who never believe in captivity anyway. My mind wanders with question over question like: Will the “New Dealers” of Democracy whether the “brown girls in the ring, nativist, nationalist, internationalist, or a mixed bag of goodies with hopefuls in the end will be victorious with no draws? Are the people ready to clean the pantry or just window shop? There is no doubt that I love clean laundry, but I am picky about what I eat. The answer to the question is lost somewhere in the preamble. Therefore, I digress. So, what, and who cares? Well, there is no luxury in the stains of rejection but deep stains once removed can be liberating, perhaps a little unforgivable, even with remnants even the slightest residue could be, though petty, resentful (like your favorite high-end or my couture purse). It doesn’t matter although tossing it out, due to being dated, may be overdue but what’s mine is sacred to me and yours should be to you. In the end, it’s a choice: to let go or hold on; although, I’m still working on making a “smart” decision to sell on the internet instead! So, what, who cares? Those who it meant something to: self-rule, self-efficiency, and statutes fought against so they would not have to live by statutes imposed upon them, that’s who. These are the elements of the story of the underdog, and is the all-time Virgin Islanders’ story. For the BVI, to have arisen from the shadows (of some Leeward Islands) in the Archipelago of the West Indies: voted most likely not to succeed, second class citizens of the British Empire and additionally as one of the most “backward” and “hopeless set” of Leeward islands is what I pen as “Amaz-Bulous” amazing and fabulous at the same time. Hopefully, history will sluggishly substantiate that “Tale” and other “Lies, Honey” because Virgin Islanders have delivered themselves out of less into more to a place that is rewarding and purposeful. So, because native sons and daughters have not washed their hands of it, Virgin Islanders no longer wish to be disparaged and, dubiously, dubbed (particularly by other islands in the Caribbean) as a “small fry” Hell to the No! Never-mind that the comeuppance of many Virgin Islanders is filled with an abundance of rags-to-riches stories, molded by accidental motivation and behaviors, self-actualization nonetheless, but always by and far deliberate hustling: hard-work, skillful hands, and brilliant minded men and women, mostly reserved persons, unrivaled by a predominantly very proud “indigenous” people whose fore-fathers; by the way, knew precisely the right time, when, and how to make a decision – strategically and politically; hardly land for farming but no one went hungry.. Therefore, if activism is infectious, then any chance to change the guards may stimulate necessary Millenniums to join Generations X and Y to the polls and blend much sweeter voices to “1-2-3-4- Walwyn et al - Won’t Win”! But whats to be will be and people can get it right if they figure out who is the "Big Deal" before they get to the polls.